Regular exercise can provide the basis for good health and wellness. In the past health meant only the absence of disease or illness. Today we define health in terms of physical, mental, social and emotional wellness. The health, fitness, and medical experts now regard exercise, practiced on a regular basis, as essential for achieving and maintaining good health. Being physically fit does not guarantee you health. However, exercise is an essential component of good health. Exercise is the basis for living a full life. It will help you bring your body, mind and spirit into concert. The effort it takes for you to be physically fit will help you to discover the individual within yourself. The research team followed these people to determine how their level of physical fitness related to their death rates. After eight years the inactive group (least fit) had a death rate more than three times greater than the very active group (most fit). However, the most interesting finding was that the death rate for group one (inactive) was two and one half times greater than that for group two (walking 30 minutes a day). Thus, in terms of reducing premature death, the study strongly suggests that a minimal amount of exercise tends to lower the risk of premature death from heart disease, cancer and other health-related causes. In a similar study done strictly with men, findings were similar. The study consisted of 12,138 middle-aged men. The report results were that moderate levels of exercise resulted in one-third fewer deaths from all causes (including heart disease) compared to those who were sedentary. These studies suggest that moderate exercise seems to be adequate for helping you to live longer and live life at your fullest potential. But, being physically fit is more that striving to live longer. Being physically fit is striving to live better. People exercise to maintain good physical appearance, have more energy to carry out daily tasks, sleep better, be able to eat nutritious foods without worrying about weight gain, improve their performance in a favorite sport or pastime, and, enjoy the feeling of being physically fit and possessing good health. Consider the fitness truths listed below. These statements are what physical fitness and exercise is all about. Physical fitness is not getting by in life, it is about living every day to your fullest capacity. This goal is within the reach of anyone who educates themselves regarding fitness. Fitness exercise is for everyone. If you’ve had unhappy experiences in athletics or physical education in the past, take heart. Not having the ability to be a great athlete isn’t what is important, reaching a point where you become the best YOU can be, is. Your body was made to be active. Your body cannot handle the stress of sitting and standing all day. Your body thrives on activity. You need to use energy to gain energy. A physically fit body is more able to function at its full potential. Fit people tend to feel good about themselves. What you consider physically fit others may not. You may be proud of your 7 minute mile, but professional track stars would think it is slow. You may feel tremendously proud for your 200 pound bench press but a professional powerlifter would not be so happy. Athletic feats are part of physical fitness but there is far more reasons why physical fitness is important. It is best to look at physical fitness as a hierarchy to attempt an accurate general definition. 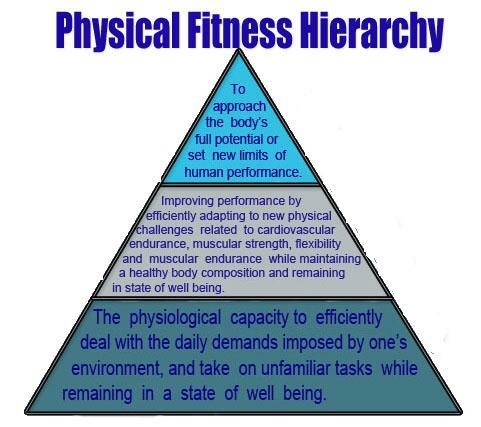 The base level of the physical fitness pyramid highlights the primary reason why physical fitness is important. This level of physical fitness directly relates to quality of life. A physically fit body has less chance of acute health problems and chronic disease. The base level of physical fitness represents your ability to efficiently perform the anaerobic and aerobic activities of daily living (ADLs) which exist in your environment on a daily basis in addition to novel tasks which may arise during day to day living. Only after your body has grown accustomed to the the base level of physical fitness you can advance to the mid level. The middle level of the pyramid is about adaptation and improvement. Most people remain at the mid level for their entire lifetime as they adapt and progress only to regress and start the process over and over again. In order to improve mid level physical fitness it is important to have a balanced exercise program. Exercise selection should focus on all 5 components of fitness. Very few are able to reach the top level of the physical fitness hierarchy. Elite athletes often spend their entire lifetime aiming to reach the very top level. The top level of physical fitness tends to mesh physiology and psychology. In order to reach the top level of physical fitness one must reach their full potential. Next story Exercise and Fitness for Kids,Fun fitness activities to keep kids healthy and Fit! What a blog post!! Very informative also easy to understand. Looking for more such writeups!! Do you have a twitter? Cold Turkey is the cheapest method.